Seriously, you guys, seriously. 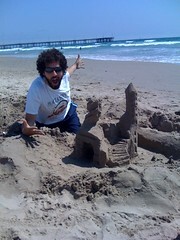 I am getting better at this sandcastle building thing. Look at the heigh on that tower!!! And those STAIRCASES! And I still haven’t got any good tools but that’s gonna change soon! The thing is, the Quizno’s contest just ended (thank you all so much for your votes, grand prize winner announced tomorrow) so now I’m rewarding myself with a few days of relaxation, sand castle building, preparing for my wedding thursday and other non-contest activities. Headed out again today, and I just got to the chapter on gabled roofs! Wish me luck!